In July of 2004 Ann, Thunder and I took a 4 hour canoe trip down the Au Sable River. 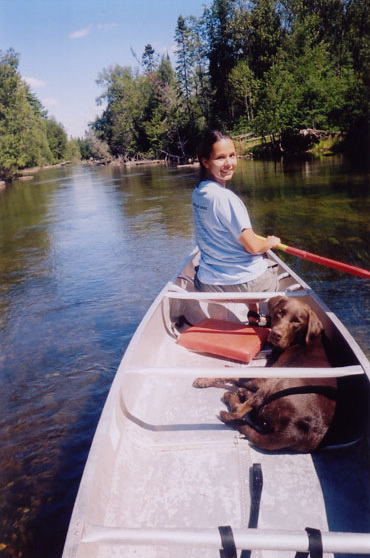 We started at Carlisle Canoes in Grayling, MI and paddled to Stephan's Bridge. It was a beautiful day. 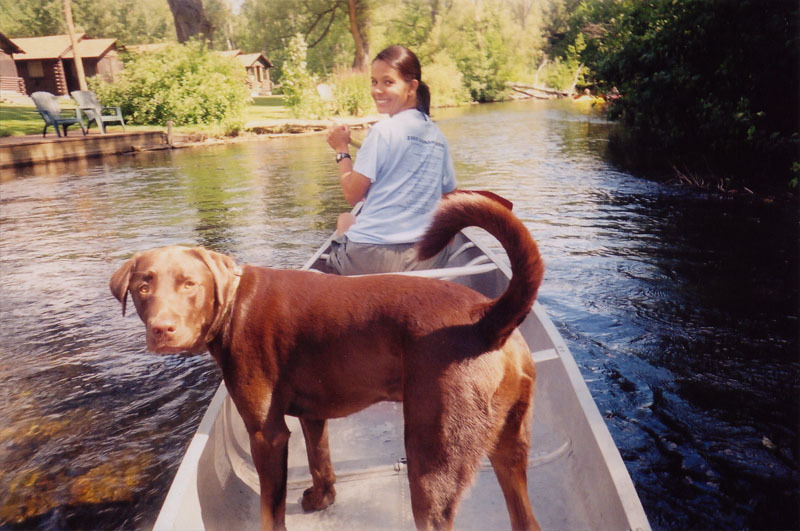 We packed a lunch and even managed to keep Thunder in the Canoe for the entire trip! Click on any of the pictures for a larger view. 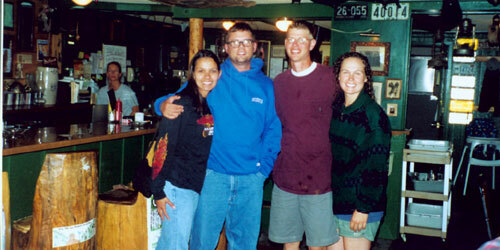 In August of 2003 Ann and I meet up with some old friends of mine. 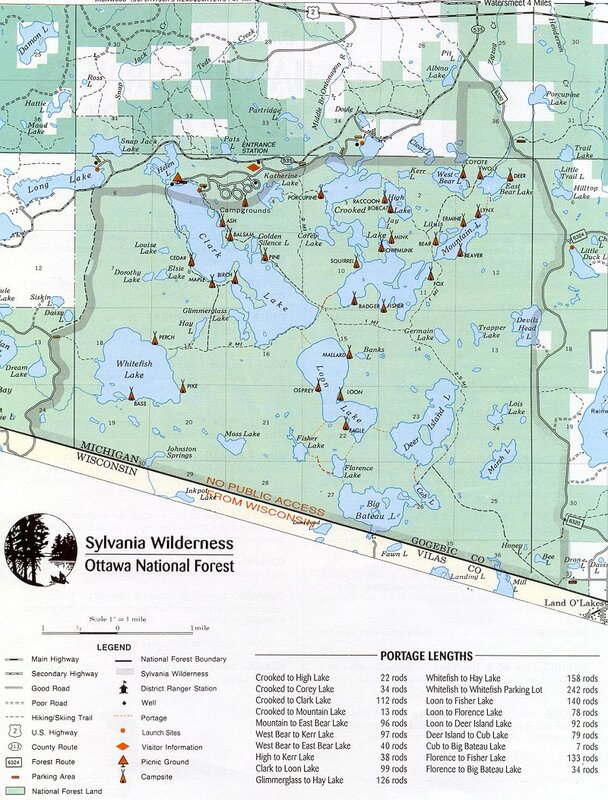 We toured Michigan's Upper Peninsula and spent four nights canoe camping in the Sylvania Wilderness near Watesmeet, MI. Click on any of the pictures below for a larger view. 1. 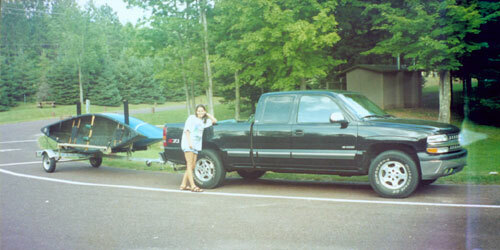 Here we stop on one of our portages to grab a quick snack of beef jerky and trail mix. 2. While stopped we replenish our water supplies at Clark Lake. 3. After a quick swim, Ann and I pose for a photo. 4. 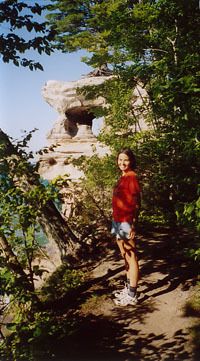 This is Ann near Miners Castle. 5. 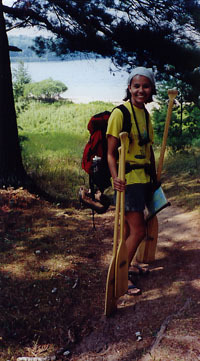 Here Ann makes like a pack mule on one of our portages between Crooked and Clark Lake. 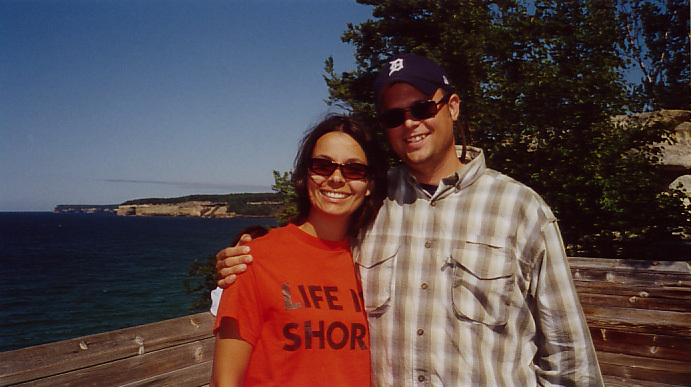 6.Ann and I at Pictured Rocks National Lakeshore. 7. 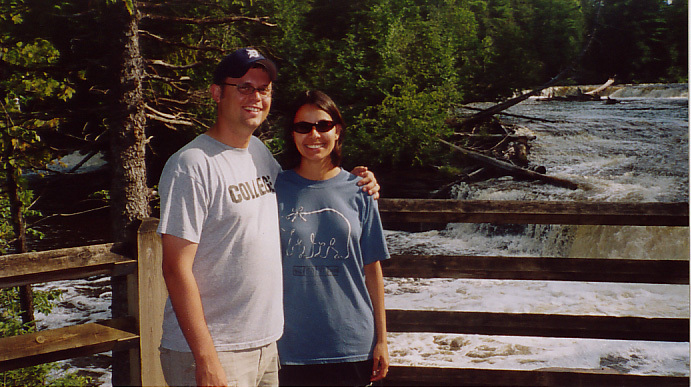 Ann and I at Tahquamenon Falls. 8. 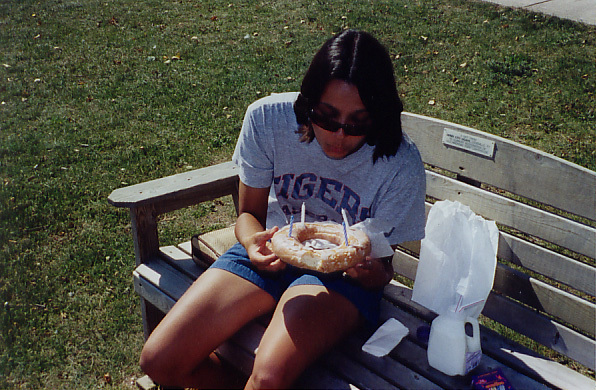 Ann enjoys a Big Mac from the Mackinaw Bakery for her birthday! This a 22" Smallmouth bass that Ann caught. 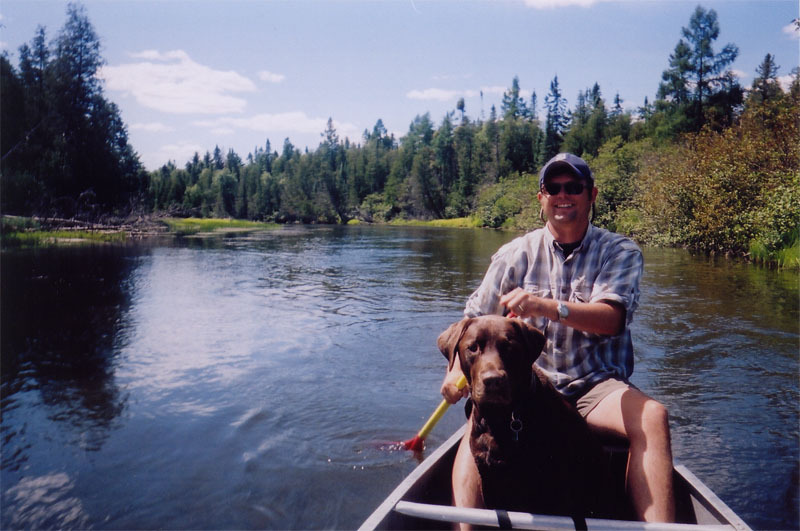 Here are some photographs from our vacation to The Boundary Waters Canoe Area Wilderness in Northern Minnesota within the Superior National Forest. These pictures were taken in early August 2002. 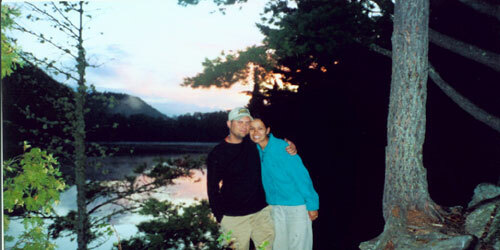 Ann and I were accompanied by our good friends Brad and Kate on our trip of the voyageurs. We paddled over 25 miles in five days, logged several hours fishing, and portaged the canoe over miles of wilderness trails. Click on any of the pictures below for a larger view. 1. Here we are at the end of the trip happy to be warm and dry with full bellies at an unique place in Grand Marias, MN called My Sister's Place. They had great burgers! 2. 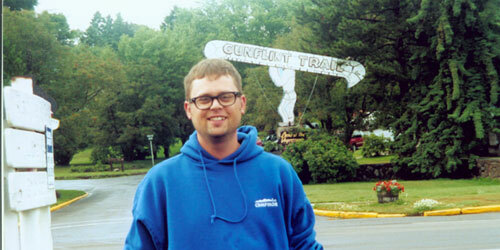 This is me downtown Grand Marias, MN near the beginning of the Gunflint Trail. 3. Here is a shot from out campsite on Little Caribou Lake in the BWCAW. 4. 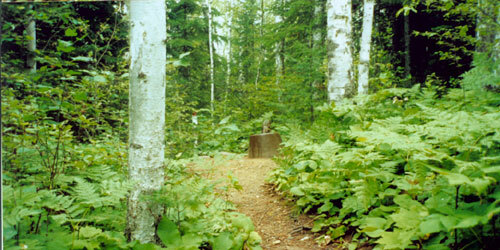 This is one of the "Box Latrines" provided for your use at designated campsite from the Superior National Forest Service. 5. 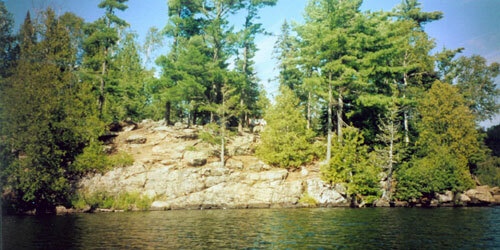 Here is another shot from our one of our campsites, this one is on Crystal Lake. 6. 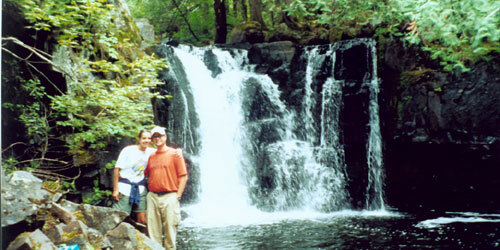 On the fourth day of our paddle adventure we took a side trip to check out Johnson Falls. 7. 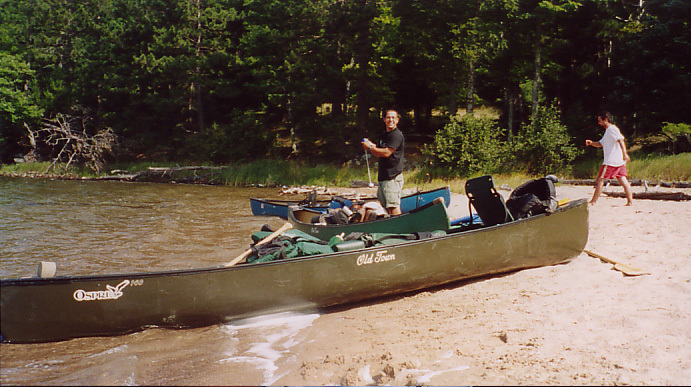 Here Ann models my custom canoe rack that I built to carry Brad's and Our canoes over the 18 hour trip to the MN, USA / ON, CA boarder. 8. 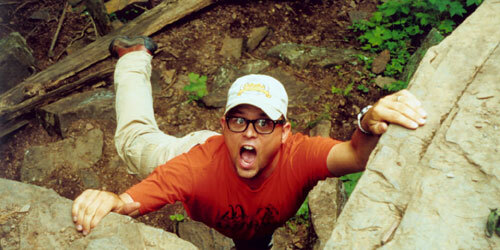 I nearly fell to certain death on our decent out of Johnson Falls canyon and Ann was fortunate enough to capture the event on film. 9. 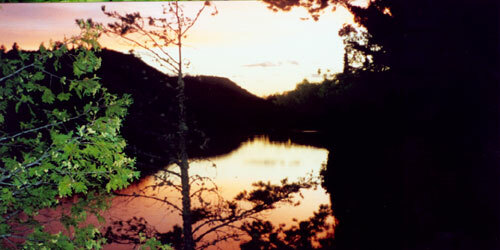 This is a shot from the canoe of our primo campsite on Little Caribou.